When I saw the “family couch” introduced by China Airlines was recently discontinued, I wanted to offer up an alternative to help flying kids sleep soundly on long flights–on any airline. Unfortunately, the BedBox (recommended here), which turns a kid-size rolling suitcase into a small bed or leg rest, is packing a hefty price tag of $199 US these days. But there is good news: this cost-effective solution for tiny travelers on any airline. This inflatable leg rest becomes a seat extension for flying kids. Use it to create a lie-flat sleeping zone for babies, toddlers and preschoolers. For their older counterparts, leaving one chamber un-inflated creates a comforting footrest. Use it at either one-third or two-thirds the maximum height. Some adults also like to use this foot rest on low setting for extra comfort in flight, including as a head rest by placing partially inflated on their airplane trays. And don’t overlook these other uses for your inflatable leg rest. Ahem, THE BACK SEAT of the car. Plus, it doubles as an inflatable stool for extra seating once you reach your hotel or cruise ship. Here you can see the different height options with dimensions shown. Tip: If your plane offers even less leg room (I’m looking at you, Spirit Airlines), simply deflate as needed to fill the space. Note: This same basic inflatable leg rest / seat extension appears for sale under multiple brand and product names. But most seem offered with two washable dust covers (for top and bottom) and carrying sack. Click here to see customer reviews and prices on Amazon (thanks for supporting this site with your clicks!). Click here to see more Pack This! 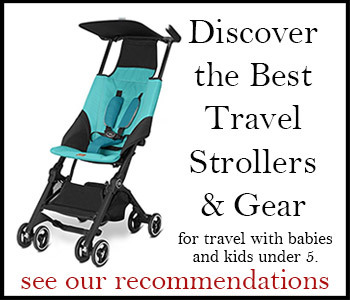 recommended products for flying with kids and general family travel. Have you pinned this to your travel board?